Windrose Farms community is sold out and is not in active development by builder. If you are interested in Windrose Farms or similar new home communities, contact us today! Our agents are very familiar with new and newer construction in Chesapeake, and can identify resale opportunities in Windrose Farms, as well as builder inventory available in nearby or similar communities in Chesapeake. To view 6 more pictures, interactive maps and the full, detailed description of the Windrose Farms community, please Login. New construction real estate abounds in Windrose Farms. This neighborhood was developed on land bordering preserved acreage. So all the nature lovers will like the serenity while all the city dwellers will be grateful when they see how close metro areas are. 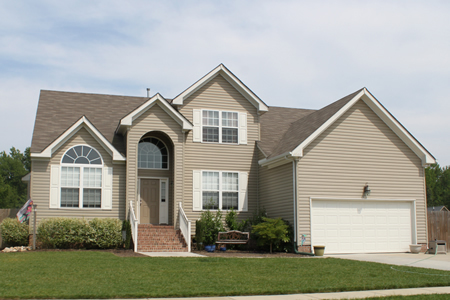 Located in Chesapeake, VA, this community is also within easy driving distance of military bases like Coast Guard Base Portsmouth, Norfolk Naval Shipyard and Naval Medical Center Portsmouth. This real estate development is comprised of 42 homes in total, spread out among the three streets. Homebuyers in Hampton Roads can see the value in the 15,000-square-foot lots that occupy this wooded land. Each new construction home here may feature a two-story foyer, formal dining room, breakfast bar, formal living room, kitchen island, master suite with sitting room, walk-in closets, dual bathroom sinks, accent niches and more. Windrose Farms makes residents feel like they’re in the country without all the noise and traffic but if cultural activities beckon, they can get to the city in a jiffy. The land of Virginia has so much to offer but especially in this particular area. Chesapeake citizens are a lucky group of people indeed. Golfers can play a round or two on the courses at Cahoon Plantation and Chesapeake Golf Club. Find shops, entertainment and eateries at Cahoon Commons, Las Gaviotas Shopping Center, Greenbrier Mall and Dominion Marketplace. Plan a romantic picnic lunch complete with chocolate covered strawberries at Deep Creek Lock Park. Who could forget the kids when living at Windrose Farms? This real estate community is in Grassfield High territory. That’s right, buyers who purchase a new construction home here get the sincere privilege of sending their teens to this highly regarded public high school. Live the life and send kids to one of the best schools in the state. New construction homes in this real estate alcove can tempt homebuyers with their good looks and prime location but it may be the school district that seals this deal. With all of these perks, who wouldn’t want to land a home in Windrose Farms? Send me more information about communities similar to Windrose Farms. Our agents gladly offer FREE property tours of Windrose Farms, Chesapeake and homebuyer consultations to all serious buyers.